Boone County birth, death, and marriage records are available from the state Health Statistics Center for $12 (in most cases). Only family members can obtain birth records before 100 years have passed (50 years for death and marriage records). For information on obtaining earlier records, as well as divorce records, call the Clerk of County Court at (304) 369-7337. Boone County was formed in 1847 from Kanawha, Cabell, and Logan Counties, Virginia, and named for Daniel Boone. 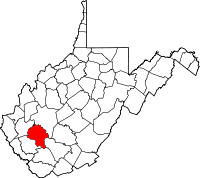 In 1863, when a new state was brought forth from the Civil War, Boone County, Virginia, became Boone County, West Virginia.